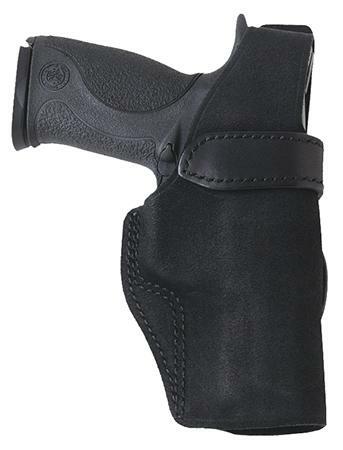 Galco's Wraith 2 is an evolution of Galco's popular Wraith belt holster, combined with features from the existing Paddle Lite and BlakGuard models to create a highly versatile and concealable multipurpose holster. Combining the best properties of premium center cut steerhide and injection-molded plastic, the Wraith 2 includes a "trench" style sight rail that easily accommodates most suppressor sights and allows easy, efficient return to the holster. A reinforced thumb-break retention strap provides secure retention with a fast draw, while the modern layout is designed to accommodate most carry-style optical sights. The Wraith 2 includes an adjustable belt slot and a paddle that quickly and easily interchangeable by the end user. This model has a black finish and is compatible with: Glock 26/27/33.